My riding partner, during the HOG Posse Ride 2005, and I came across this “woodtail” bike outside a 1950’s style diner outside Windham, New York. It was parked on a slab, next to the parking lot. 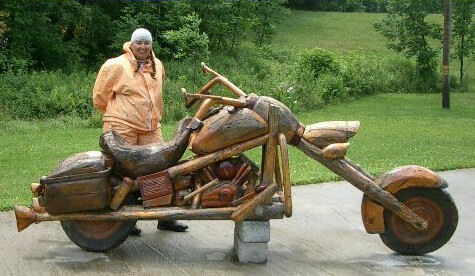 The artist’s name and address was wood burned into the bike. It was a miserable day to ride, and we had be in and out of rain all day. Finding this lifted our spirits. We took these photos before we went into the diner and had a nice hot lunch. This “woodtail” bike was complete, wheels, tires, battery, controls, headlight, finned jugs, pushrod tubes, bags, gas tank, taillight, frame, front crash guards, turn signals, floorboards, fenders, exhaust pipes, etc. Every time I walked around it I found another item that I had not noticed previously. The only information on the bike, other than the artist’s name & addy, was a sign requesting people not sit on it.